Prepare your area and get your Chakra stones ready. I tend to keep the ones I use for this in their own pouch so that they are easy to find and readily easily. Mojo Bag – Chakra Click here for more info. For this meditation it is preferable to lie down as you will be placing stones on the relevant Chakras. 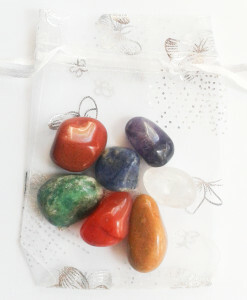 Get into position and place your correct stones on each of your chakras – working from the Base Chakra up. Base Chakra place Red Jasper, Sacral place Carnelian, Solar Plexus place Yellow jasper and so on up until you have all seven placed in their correct places. Close you eye and relax. Taking 3 deep breaths which you release slowly while visualizing all of the tension leaving your body and you sinking deeper into the earth. Now focus your energy towards your Base Chakra and see it as a earthy red spinning wheel. Focus on the purity and cleanliness of it spinning as you allow it to spin 13 times in a clock-wise direction feeling it come more into balance with each rotation. Now move your focus towards your Sacral Chakra and see it as an vivid orange spinning wheel. Focus on the purity and cleanliness of it spinning as you allow it to spin 13 times in a clock-wise direction feeling it come more into balance with each rotation. Now move your focus towards your Solar Pelxus Chakra and see it as an bight yellow spinning wheel. Focus on the purity and cleanliness of it spinning as you allow it to spin 13 times in a clock-wise direction feeling it come more into balance with each rotation. Now move your focus towards your Heart Chakra and see it as a gentle green spinning wheel. Focus on the purity and cleanliness of it spinning as you allow it to spin 13 times in a clock-wise direction feeling it come more into balance with each rotation. Now move your focus towards your Throat Chakra and see it as an vibrant blue spinning wheel. Focus on the purity and cleanliness of it spinning as you allow it to spin 13 times in a clock-wise direction feeling it come more into balance with each rotation. Now move your focus towards your Third Eye Chakra and see it as an deep rich indigo coloured spinning wheel. Focus on the purity and cleanliness of it spinning as you allow it to spin 13 times in a clock-wise direction feeling it come more into balance with each rotation. Now move your focus towards your Crown Chakra and see it as an intense violet spinning wheel. Focus on the purity and cleanliness of it spinning as you allow it to spin 13 times in a clock-wise direction feeling it come more into balance with each rotation. Take a moment to feel how good you feel feeling balance and in tune. Now place a bright cord of energy from your heart area and anchor yourself deep down into mother earth feeling wonderful and grounded. Now place a bright cord of energy from your heart area and anchor yourself high above into the ever expanding universe and understand that you are now fully anchor, balanced and aligned. Lie here for as long as you need feel and enjoying the wonderful sensation, and when you are ready bring yourself back and become aware of your surroundings and slowly open your eye. Now remove your stones starting from your Crown and working your way down to your Base Chakra. I always place my used stone/crystals on a slab of Selenite for cleaning once I have used them, that way they will be ready to go when I next want to enjoy their energy. Repeat when needed and enjoy the wonderful sensation that it will bring into your life particularly if done on a regular basis.